Microwaveable and fragranced with lavender pure essential oil. Ideal for relieving stress, soothing aches and pains and snuggling with to keep warm on a cold night. Simply heat to enjoy relaxing warmth and fragrance. Place on your tired body and feel the tension melt away. This body warmer can also be used as a cooling compress. Please read these instructions carefully before use as they are to ensure your safety. Place half a cup of water inside the microwave whilst reheating to assist rehydration. Be careful when removing the cup of water as it may be very hot. Place the body warmer onto a non-metallic plate and place inside microwave oven, making sure the filling inside the body warmer is evenly distributed (this helps avoid hot spots occurring during heating). Make sure the turntable is able to rotate freely and is clean and free of grease or anything which could cause burning. In the event of overheating, allow to return to room temperature and inspect all seams and condition of the body warmer, do nut use if damaged. Heat for 1 minute then carefully touch test. Continue to heat in increments of 10 seconds until desired temperature is reached, up to a maximum of 2 minutes for 500-750 watt microwaves and a maximum of 1½ minutes for 800-1000 watt microwaves. Remove outer packaging and place the body warmer in a plastic bag in the freezer for at least 3 hours. See care label for cleaning instructions. Store in a clean and dry environment. Filling: Flaxseeds fragranced with lavender pure essential oil. If the body warmer gets damaged whilst hot, allow it to cool to room temperature before you dispose of it. The body warmer is biodegradable and should be disposed of through normal household waste. Inspect the body warmer at regular intervals. Discard if found worn or damaged. Clean only in accordance with the manufacturer`s instructions. This product can cause burns. Avoid prolonged direct contact with the skin. The heating of the body warmer should only be carried out by an adult. Not suitable for children under 3 years old due to the heating nature of this product. Allow to cool to room temperature before reheating. 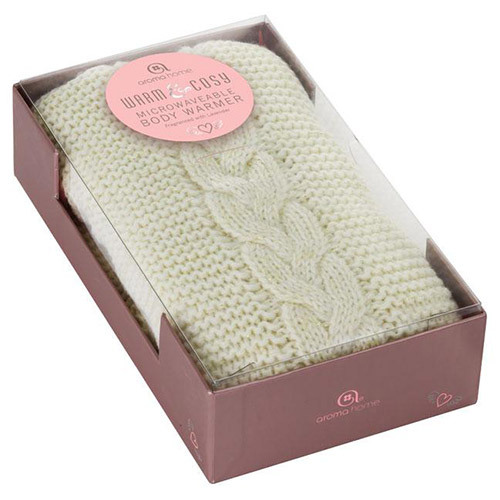 Below are reviews of Aroma Home Microwaveable Body Warmer - Cream by bodykind customers. If you have tried this product we'd love to hear what you think so please leave a review.